Bad posture makes your life harder, plain and simple. We've known this for a long time now. 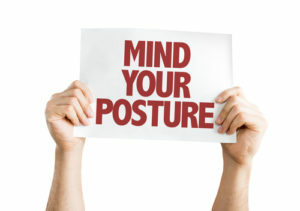 But despite all the evidence piling up, few of us take our posture health seriously enough to do much about it. This needs to change. The thing about your posture is that it doesn't simply stay the same. It either improves through deliberate effort, or, in most cases, it gets worse over time. We've all seen the people who are much older than us, hunched over and struggling to move. You might assume that becoming a hunchback is a “normal part of aging”, but take one look at some indigenous societies and you'll see that this isn't true. It's not hard to see why bad posture is so common these days. If you type on a computer, sit at a desk, use a smartphone, drive a car, you are doing it to yourself. 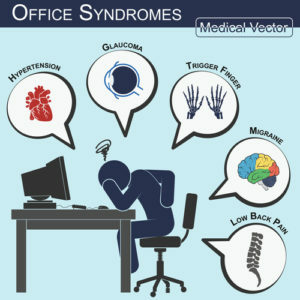 The average office worker is at the job for 9 hours, spending most of that time sitting in a chair at a computer. Add in 1-2 hours of commuting (i.e. sitting in a car or on a bus), and a few more hours of sitting after work, and… well, you get the idea. We sit too much. Consider how early humans lived. Did they sit at desks? Did they crane their necks every 5 minutes to look at their phones? No. They were up on their feet most of the time, moving the way we were meant to. Sure, even prehistoric people probably sat down to rest, but sitting occasionally is much different than sitting for 10+ hours each day the way most of us do. This is not breaking news, of course. Most people are at least somewhat aware that sitting too much is bad for you. But saying something is “bad for you” is usually not enough to inspire change. That's why we've put together a list of nine specific ways poor posture is harming you. If you're not sure whether you should do something about your posture, read on and see for yourself. 1. You Are More Likely To Need Assisted Living. A study done in Japan found that spinal posture was associated with whether or not people required assistance with daily activities when older. The study tracked a group of over 800 people aged 65 or older, and over a four-and-a-half year period, the people who had an unhealthy forward bend to their posture were more likely to need assistance with daily activities by the end. 2. It's A Pain In The Neck. Your head makes up almost 15% of your body weight. So you can imagine how much strain it causes when your head is dangling several degrees forward all the time. According to a Korean study of 19-24 year olds, having forward head posture was associated with neck disability and pain. 3. It Makes It Harder To Breathe. Your lungs need space in order to properly fill up. It makes sense, then, that hunching over your smartphone makes it harder to breathe deeply. There is research to support this, including a study that compared lung function in subjects using smartphones for an hour to those who weren't. Not surprisingly, the people using smart phones had diminished lung function. 4. It's Keeping You Unhappy. “Keep your head up” is more than just a figure of speech. It turns out that poor posture makes it harder to snap out of a bad mood. One study done in the Netherlands tested how well people with bad posture were able to regulate their moods after being put in a negative mood. As you might guess, they found that those with bad posture had a harder time getting out of their bad moods as compared to people with straight posture. 5. Bad Posture Hurts Digestion. Even subtle changes in your posture can affect your body's ability to digest food. In one study that looked specifically at protein digestion, subjects who had a forward head tilt were unable to digest as thoroughly and efficiently as those who had straight posture. In practical terms, they literally absorbed less protein into their bloodstreams as compared to their upright counterparts. 6. Forward Head Posture Could Lead To Jaw Disorders. The temporomandibular joints (jaws) are a source of pain for countless people with TMJ dysfunction. Poor head and neck posture might play a role in that for some people. One study compared posture of people with TMJ disorders to those without, and found that more people with TMJ disorders also had bad posture. This doesn't mean that posture alone causes TMJ problems, but it does seem to be related. 7. Bad Posture Decreased Your Shoulder Range of Motion. If you usually keep your shoulders in a hunched, rounded position, it could make it harder to achieve a full range of motion. One study out of the UK confirmed this when measuring range-of-motion in subjects with straight posture and those with bad posture. This means your posture could be restricting your athletic performance and ability to do even routine activities. Back pain is becoming common even in young age. As soon as kids start spending their time sitting in desks all day, their risk for crippling back pain starts to increase. This was exactly what researchers in Nigeria found when studying adolescents in the classroom. In this case, many of the study subjects engaged in physical work after school. This might suggest that even being active outside of school or work is not enough to undo harm from sitting. 9. Your Posture Might Affect Your Success In Life. One study from the 1980's found that people with erect posture were more likely to be perceived as dominant and successful than their peers with less-than-stellar posture. And in fact, the same people who were perceived as successful also performed more successfully on critical exams in high school and college. The above list is only a small sample of the research out there on posture and its effects. But it should be clear that posture plays a more important role in your life than you might have realized. Especially when you consider the compound effect that some of these problems might have. Dealing with back pain is difficult enough, but when also have a depressed mood, poor digestion, and any of the other posture-related problems, it can dramatically impact your quality of life. But you shouldn't panic just yet. Poor posture is a largely fixable problem. Thanks to the internet, we can learn how to treat bad posture from world class physical therapists and health experts. There are literally thousands of YouTube videos about how to correct common posture problems. Many of them are high-quality and could prove helpful for lots of people. There are a number of physical therapy exercises that can help naturally align your head and neck. Chin tucks, self-massage, and static stretching are all common ways of treating forward head posture. 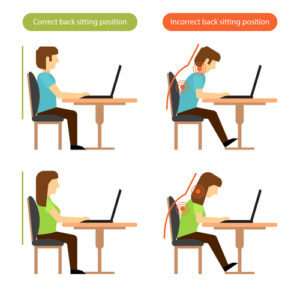 While you can find demonstrations of these movements online for free, we recommend a program called Forward Head Posture Fix by a physical therapist named Rick Kaselj. This inexpensive program teaches a “flow” sequence of movements that, when performed each day, can lead to a dramatic improvement in head and shoulder posture. If you have 10 minutes to spare each day, Rick Kaselj's popular program can work wonders. Your hip flexors are the group of muscles in the fronts and sides of your hips. These muscles become short and tight when we sit too much, and over time they can cause all kinds of imbalances and pain. Again we recommend a program by Rick Kaselj, this one meant to address tight hip flexors. It is called Unlock Your Hip Flexors, and it is also a flow sequence that only takes about 10 minutes. We reviewed the program in more detail in case you want to check it out. Poor posture will eventually lead to back pain. Sometimes sooner than later. If this is the case for you, it's important to correct your posture in a gentle way so you don't aggravate your pain even further. This can be tricky to do, which is why we recommend learning techniques from an expert. A well-known Pilates instructor named Emily Lark has a program called “Back to Life” that coaches you through a gentle sequence of movements that help release your sore back muscles while simultaneously strengthening your core and correcting imbalances to prevent further injury. A relatively unknown physical therapist named Steve Young also released his proprietary back pain relief program that he used in private practice. Most of us don't have the time or money for constant physical therapy sessions and chiropractor visits. Fortunately there are steps you can take by yourself, in your own home, to correct your posture and alleviate pain. For example, many people like to use acupressure mats, which simulate real acupuncture (without the needles!). These are real benefits to acupuncture, and acupressure mats can provide similar benefits from the comfort of your living room. Placing a cushion under your tailbone while you sit can make you a lot more comfortable. When we sit for long periods, the pressure on our tailbone (known as the coccyx bone) builds and leads to pain and discomfort. Even a regular old pillow will provide some relief, but an ergonomically designed cushion is worth the extra money. Whether you have chronic back pain or just sore muscles from working out, few things feel better than a massage. It's too bad that most massage therapists charge an arm and a leg. While it may be nice to have a professional masseuse work on your back, self-massaging devices have been getting more and more effective. If you find a good back massager, you can experience a deep massage every day for as long as you want. It should be clear by now that if you take your health seriously, your posture must also be taken seriously. Ignoring your posture now will only make things worse in the future. Understanding the problem is the first step, but now you must take action. Fortunately all it takes is a few minutes each day to alleviate many of the issues poor posture causes.